As we continue to look for new and innovative ways to show appreciation to our supporters and alumni, we are offering this complimentary perk that gives you access to 20 – 60% off on movies, hotels, shows, concerts, sporting events and more. This is just a small token of our appreciation for your hard work. Please take 2 minutes today, and sign up for these complimentary perks. Fill out the information to become a member (use your work email address). 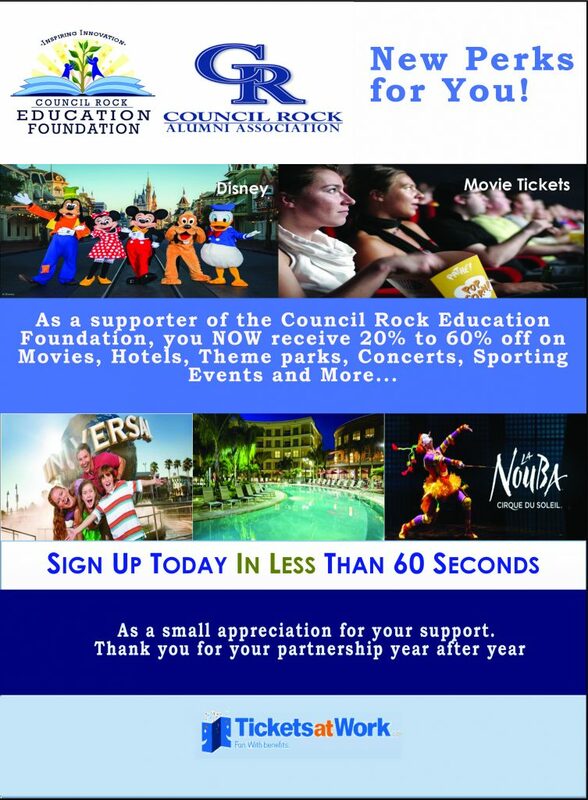 Thank you for being a partner in innovative education for our Council Rock students. Hope you enjoy these great perks! P.S. Please consider making your annual charitable tax-deductible gift today – click here.